Wednesday through Friday in the middle of Bondi Junction’s pedestrian only area on Oxford Street, markets play host to fruit and vegetable sellers, bread makers and the occasional crêpe maker, among many others. 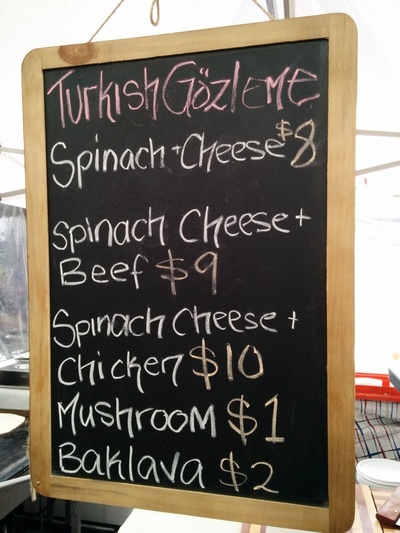 Turkish gozleme also make a regular appearance at these markets, in a stall with a somewhat worn red sign. A chalkboard menu is enough to list all the menu options – cheese, spinach, meat and mushrooms, in various combinations. The open stall means customers can watch their gozleme being made by the women who run it. Gozleme is a dish made mainly with a simple and very thin pita bread which is fried to crunchiness with filling inside - the filling varies, as recipes do, from region to region in Turkey, but you'll find all the usual suspects of Turkish cuisine - haloumi, spinach and meats and spices, in most places. The spinach and cheese ($8) is the simplest combination and probably the healthiest. It’s full of the standard shredded spinach, with bits of salty goats cheese sprinkled over it. A chalkboard menu hung in front of the stall - as simple as it gets for indecisive food lovers. The open stall means customers can see the whole show. They see the dough being rolled and filled. 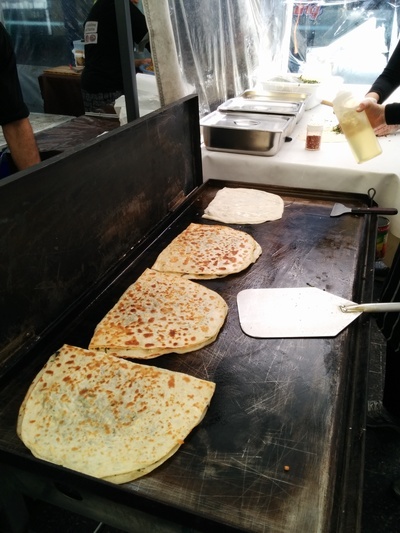 They hear the faint sizzle of the oil as the gozleme are fried on a large, open hot plate and cut in rough rectangles which make it perfect for eating while strolling through the market stalls. Pre-cut lemon slices are on stand-by to be plucked out of the bowl and included with the gozleme. 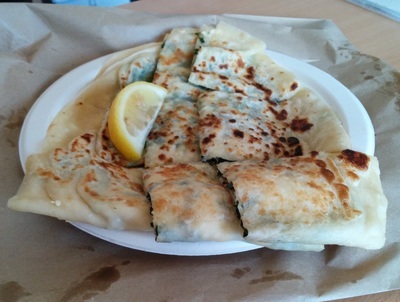 A spinach and cheese gozleme served up on a plastic plate or bowl for take-away, with a wedge of lemon. The whole thing is very quick and takes a little over five minutes per gozleme, but once you’ve got the gozleme, there’s the problem of finding somewhere to sit and eat. If you happen to be a messy eater, like me, maybe try and find a table. If not, there’s usually ample bench space. If only markets had more seating! The gozleme itself is yummy and quite light. The spinach is soft and wilted, with the perfect amount of cheese to maintain saltiness and soften the filling. The dough is thin and usually doesn’t overwhelm the filling. Around the edges it sometimes has either stuck together and becomes thick and chewy or doesn’t have much filling inside, which isn't so pleasing. I also don’t recommend skipping the lemon – its sour hit adds a zest which the gozleme needs to balance the heavier dough and filling flavours. 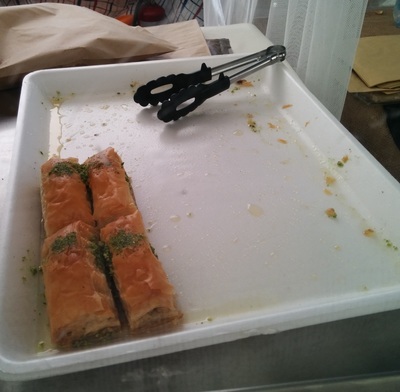 This almost-empty tray of Baklava speaks for itself. There's always the possibility of dessert too, with small slices of Turkish Baklava on sale for $2.00. Baklava, which traditionally appears in Greek, Turkish and Lebanese cuisine under different aliases and slightly different forms, is a filled pastry dessert. The dessert combines layers of crispy pastry and a sweet, crushed and lightly spiced nut filling drizzled in sugar syrup. These gozleme make for a great light lunch, at a great price. Where: Bondi Junction Village Markets, on the western end of Oxford Street Mall. When: Wednesday through Friday from about 8 am to 5 pm (depends on how busy they are).